LED lights are the most popular lighting trend of the generation. However, this is a trend that is only going to grow in popularity as more and more people recognize all the benefits that making the switch can bring. These lights costs less in the long run for homeowners, they are more durable than traditional bulbs, you can be more creative with their application, and they are better for the environment. If you are looking to jump on the LED light bandwagon and want to install some into your back garden, then read on for three tips for enhancing landscape lighting with LED solutions from trusted LED lights suppliers in Dubai. 1. Familiarize yourself with the different LED lighting options. One of the incredible things about LED lighting is that they can be utilized in practically any situation. Unlike incandescent bulbs (which are known for being limited in their uses), LED lights, on the other hand, are available in a variety of designs. LED Downlights: The most popular type of LED fixture due to their efficiency, durability and safety. LED Spotlights: Best used for ornamental reasons and to create accent lighting. LED Panel Lights: A common choice for offices and commercial spaces as they produce some of the brightest light on the market. LED Floodlights: Particularly designed for large, outdoor areas. LED Spike Lights: The perfect option for outdoor, landscaping needs, LED Spike lights were created with the specific intention of lighting flower beds and other parts of a garden. This design ensures that LED Spike lights are some of the most flexible LED products available. Therefore, unless you have a massive outdoor area (in which case you may want LED Floodlights), in order to enhance your landscape lighting, you will want to opt for LED Spike Lights. One of the significant benefits of LED lighting is that it can do directional lighting (spotlights, task lighting) excellently, which allows you to have light focused in your garden right where you want it. 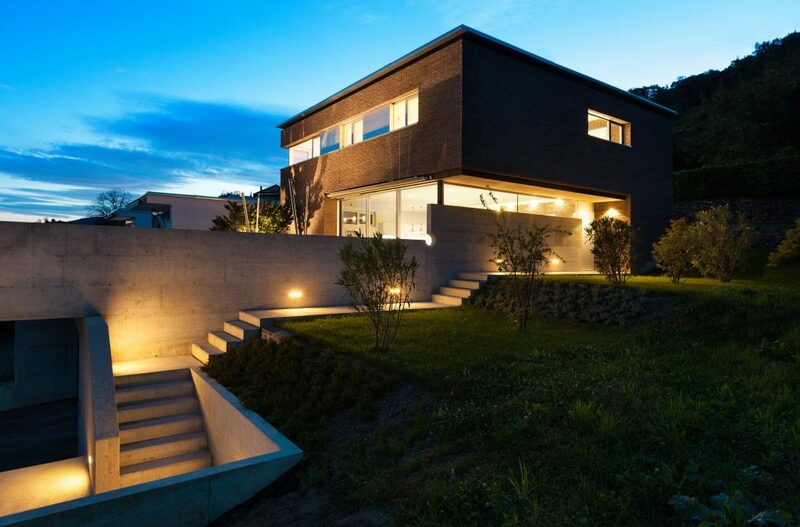 Keeping your personal landscape well-lit is vital both for safety and aesthetic reasons. The most well-designed landscape lighting plans ensure that homeowners are able to discourage intruders from entering their property, as well as have optimal light to organize night gatherings. When it comes to security lights, you may want to opt for LED lights installed above eye level that illuminate your pathways and steps. This technique is often called “downlighting” and is useful regarding security concerns. As LED lights are so customizable, they are the perfect options for landscape lighting needs; all you need to do is utilize your imagination. What do you want your landscape lighting to look and feel like? What areas of the garden do you want to highlight? Once you begin considering which areas or features you want highlighted by your lights, it is time to start making a plan. In the drawing, sketch your home and landscape, as well as any other important details (however small), such as steps, driveways, large trees, ponds, patios, and other notable features. On this piece of paper, start sketching what your imagination generates. Keep in mind the design and vibe of your home, as you want your lighting plan to complement the current style of your house. Whether it is the color or the design, you want everything to work well together. Additionally, LED lighting is prepared in many amperes and voltages, so you can also choose from having a very light glow, to a vibrant light, and everything in between. Perhaps, in different areas of your landscape, you will require varying intensities of light, and in some places, waterproof LED lights. 3. Switch soon to save money and time. LED lights are undoubtedly the most efficient options for lighting solutions. Not only do they save you money in the long run (they use a fraction of the energy that other bulbs require), but they also are the most convenient. By installing LED lighting in your landscape, you will only find yourself having to replace the bulbs when they fail — which happens on average after 40,000 hours! So, you have plenty of time to enjoy your well-lit garden. In addition to the above tips, it is essential that you keep in mind the positive impact that switching to LED lights has on the planet. Incandescent bulbs merely transform 10 percent of their power into light (meaning 90% of the energy is wasted) and LED lights convert 95% of their energy into light, which means that LED lights are more efficient, more economical, and more environment-friendly. This is why, by exchanging only one light bulb with LED, you can decrease your energy consumption by 70-90 per cent. So, remember that if you install LED lights into your landscape lighting plan, then you don’t need to be as concerned about negatively affecting the Earth (at least as much as traditional lighting does). Speak with reputable suppliers today to learn more about upgrading your landscape with LED lighting. Have you switched any part of your home to LED lighting? Are you considering using them in your landscaping plans? Let us know your thoughts about LED lights in the comments below!